A few months ago, we told you about the exciting street style initiative, 1st Class Fashion, a social network which rewards the best street style looks with first class flight tickets. 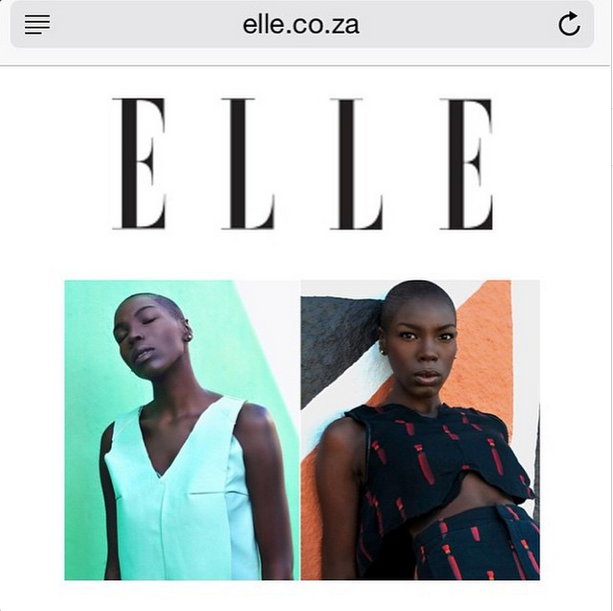 On a recent visit to SA, 1st Class Fashion photographer Bukunmi Grace visited the ELLE offices. 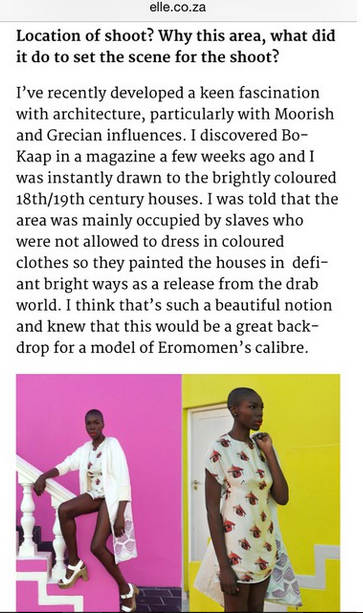 We chatted to her about shooting Nigerian model Eromomen in Cape Town’s Bo Kaap for 1st Class Fashion’s LA Billboards. Holly: Who is Eromomen? Why did you choose her for your shoot? Bukunmi Grace: Eromomen is a Nigerian model who I met 2 years ago during fashion week. Since then I’ve heard nothing but great things about her personality and I’ve seen her in several campaigns from BMW to Urban Outfitters so I know how much the camera loves her. She was the perfect choice for 1st Class Fashion’s LA Billboards because she’s absolutely regal and stunning. Most importantly, she embodies the adventurous jetsetter who can pull off anything from monochrome to mixed prints. Holly: You dressed Kwena Baloyi in Matte Nolim and Eromomen in Julienne. What’s your favourite piece in Matte Nolim’s collection? Bukunmi Grace: This is so hard! I am completely in love with the velvet boxy crop. That would have been so fitting in Clueless but it’s as timeless as Jackie O. But the dress of my dreams is the pearly shift with feather trim. It’s dreamy and structured at the same time. 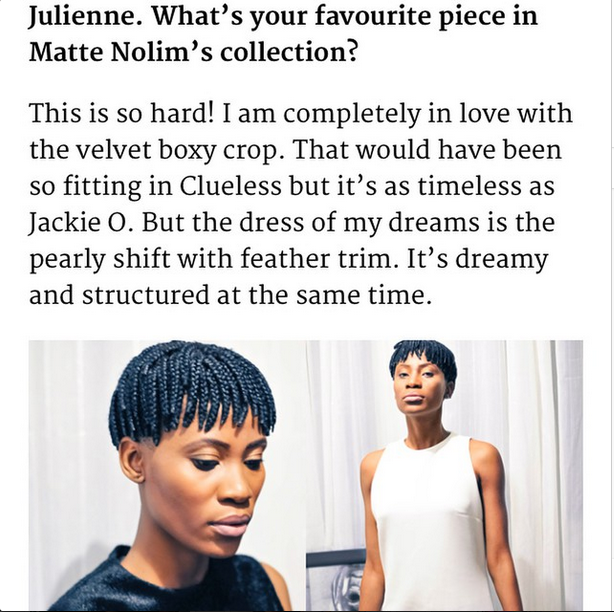 Holly: What do you love about Julienne’s collection? Bukunmi Grace: Julienne does a great job of making prints look utterly sophisticated with inventive tailoring. Her silhouettes are dynamic and flattering but what I admire most is that she incorporates appliqué and other fun design elements into her pieces. Holly: Impressions of South Africa? Bukunmi Grace: I was absolutely swept away by South African culture, fashion, people and sites. I expected the best based on various recommendations but there really is so much to do and see that you’d have to experience it first hand. For instance, Cape Town is a concentrated version of my favourite LA neighborhoods, somewhat like an urban paradise. Johannesburg has so much of my culture and soul that you can’t help but find inspiration on every corner. The youth culture in Braamfontein reminds me of Wicker Park in Chicago, Williamsburg in New York and Echo Park/Silverlake in LA, places that are breeding grounds of creativity. Holly: Location of shoot? Why this area, what did it do to set the scene for the shoot? Bukunmi Grace: I’ve recently developed a keen fascination with architecture, particularly with Moorish and Grecian influences. I discovered Bo-Kaap in a magazine a few weeks ago and I was instantly drawn to the brightly coloured 18th/19th century houses. I was told that the area was mainly occupied by slaves who were not allowed to dress in coloured clothes so they painted the houses in defiant bright ways as a release from the drab world. I think that’s such a beautiful notion and knew that this would be a great backdrop for a model of Eromomen’s calibre. Holly: How would you describe fashion in SA? Any favourite designers? 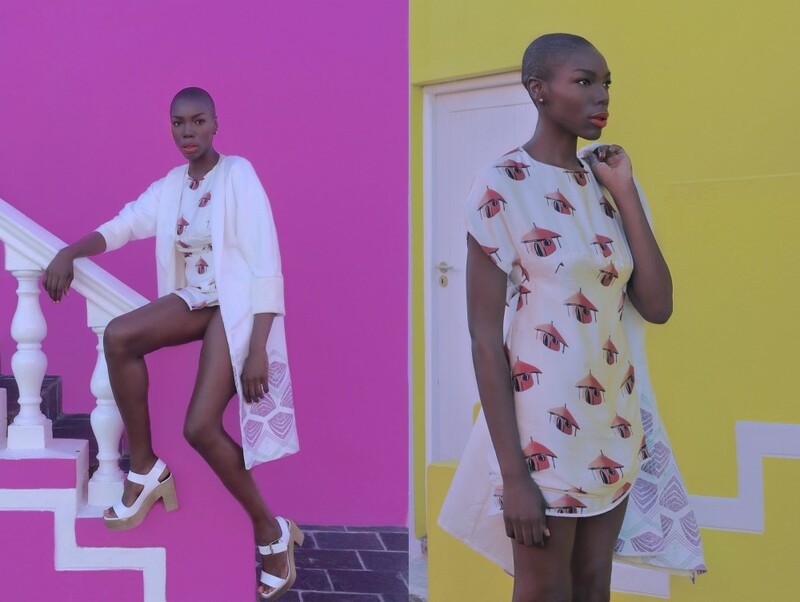 Bukunmi Grace: Fashion in South Africa is vibrant and bold, with a hint of dark romanticism. Kat Van Duinen and Black Coffee have perfected the dark romantic but intricately detailed design aesthetic. David Tlale was my first introduction to South African fashion and I’ve always loved how elaborate and imaginative his collections are. Every collection is a dive into his complex imagination filled with signature tailoring and bold accents. During SAFW Jenevieve Lyons work also caught my eye. It’s clean and minimalistic but certainly edgy. Holly: What do you hope to do for South African fashion in LA? Bukunmi Grace: I hope that when people see my work they would consider accepting more South African designers for fashion exhibitions which could help launch South African pop-up boutiques and brick and mortar buildings. I think South African designers would fare well in LA. Matte Nolim and Julienne are great examples. It fits well into the minimalistic but regal vibe that Angelenos love.